The latest issue of the Peanuts comic book is on sale in comic books stores as of Wednesday, April 18. 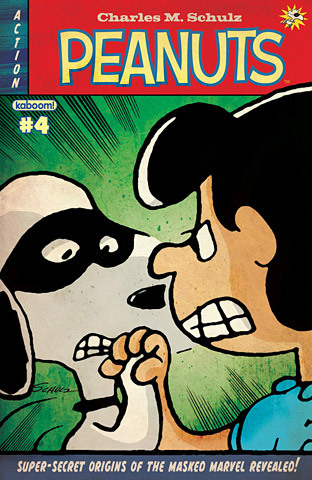 The stories in Peanuts #4 are "Super-Secret Origins of the Masked Marvel" and "Fight for Flight" (a story about Charlie Brown and kites) as well as a handful of Charles Schulz Sunday comic reprints. As with previous issues, Comic Book Resources has a 5-page preview. You can also order the comic online from Boom! Studios (but you'll have to pay for shipping). This is final issue of the current run of Peanuts comic books; they'll be taking a break for a few months, but are expected to return towards the end of the summer (the exact date hasn't been announced yet). Vince Guaraldi at the Piano gives Guaraldi the long-overdue recognition that he deserves. In its 390 pages, the book chronicles his years as a sideman; his attraction to the emerging bossa nova sound of the late 1950s; his collaboration with Brazilian guitarist Bola Sete; his development of the Grace Cathedral Jazz Mass; his selection as the composer for the Peanuts animated specials; and his emergence as a respected veteran in the Northern California jazz club scene of the 1970s. The book also includes an extensive discography and index. We think all aficionados of the original Peanuts music sound and jazz music will appreciate this in-depth look at Vince Guaraldi. Vince Guaraldi at the Piano is available now from the publisher, McFarland & Company; visit their website to see the book's table of contents, read an excerpt, and to place an order. The book can also be ordered from Amazon, but their stocking of has been erratic; you may get quicker service by ordering it directly from McFarland. A Kindle version of the book is also available at Amazon. 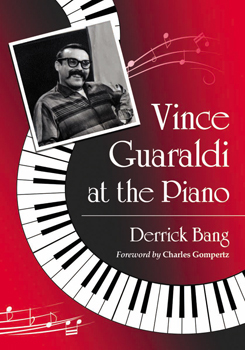 You can also get a taste of Derrick's knowledge and research on Vince Guaraldi by visiting his Guaraldi pages at FiveCentsPlease.org. Unfortunately, neither ABC nor any other network plan to broadcast It's the Easter Beagle, Charlie Brown on television this year. The special is available on DVD and from iTunes, though, if you don't already own a copy. Visit the main FiveCentsPlease.org website for tons of Peanuts information, trivia, and history!